Phi Phi has a plethora of restaurants offering international and local cuisine its possible to eat somewhere different every night, even if you're here for a fortnight. There is a good variety of foods on Phi Phi Island in the village where yo can find restaurants independent to the main hotels and resort. The resort hotels at Laem Tong and Loh Bagao ie Phi Phi Island Village Resort and Phi Phi Lagoon have there own in house restaurants.... read more. Phi Phi Dining is among the best in Thailand though not all the best restaurants are in the hotels. From fresh fish to sushi, from local curries to steaks, Phi Phi Restaurants offer a wide selection for the traveler. 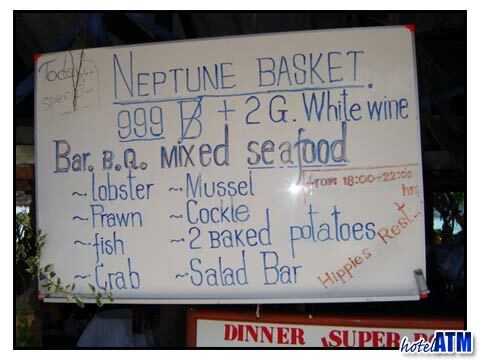 In and around the Phi Phi Don Village there are many types of seafood and ... read more. Close the main ferry pier on Phi Phi Don, Amicos Restaurant is one of the key pier head venues and ideal for a pre ferry bite to eat. In the evening it has a simple charm. Backing on out directly to the sea and fronting the main street, it is one of the places to be seen on the island.... read more. Eating out on Phi Phi combines the tropical tastes of Thailand, the cuisine of the Phi Phi Hotel resorts and locally run restaurants to give a really good selection of menus for the "foody", the Thai food savvy, the western pallet and those who just can't get enough of street food. ... read more. Steak may not be native to the Phi Phi Island restaurants, but some establishments have really adopted the art of grilling. There are so many tourists that travel to Phi Phi Island. These tourists want a taste of Thai culture in a Phi Phi Island restaurant, but they also want a taste of hom... read more. Phi Phi Island has an abundance of restaurants offering authentic Thai cuisine, as well as International dishes borrowing on Japanese, Chinese, Italian, French and American influences. Eating atop bamboo decks, under a midnight-blue sky littered with stars is the epitome of romance. Perhaps... read more. To eat well is to live well and no more important is it than when you are on holiday. Unni's style is a fusion of tradition meals with an eye catching and sparking presentation. But it's only when you take your first bite of each course that you appreciate you are in a restaurant that cares... read more. Phi Phi Island cuisine is something people from all over the world can enjoy. Phi Phi Island Restaurants serve delicious and creative dishes infused with rich spices and mouth-watering flavors. Phi Island cuisine consists of spicy salads, warm noodles, curries, coconut milk, lemongrass, tof... read more. You spend an afternoon in the hot sun either sunbathing or snorkeling or kayaking-Phi Phi Island's most popular activities. You take a refreshing cool shower and watch the sunset on your bungalow's private balcony. Your stomach beckons for some native Thai food-perhaps seafood. It's time to... read more. Pluto's Italian Ice Cream is a treat everyone across the world can enjoy. Ice cream is a common treat enjoyed by nearly every culture. Phi Phi Island ice cream is no different. As a matter of fact, Phi Phi Island ice cream may be even more popular because the temperature stays hot throughout the entire year in ... read more. Fatties no longer exists on Phi Phi Island as it moved to Chalong Phuket after the tsunami. This is an article about the way it was, a real classic dining experience, made in a really unique setting by a classy character. It has now been replaced by other classic dining experience of Unni’s Italian Restaurant.... read more. There is nothing more succulent than Phi Phi Island seafood served fresh with vegetable and rice. Since this Thai Island is largely inhabited by fisherman, you know your Phi Phi Island cuisine has come from an honest, hard day's work in the Bay. There are some top notch restaurants that spe... read more.